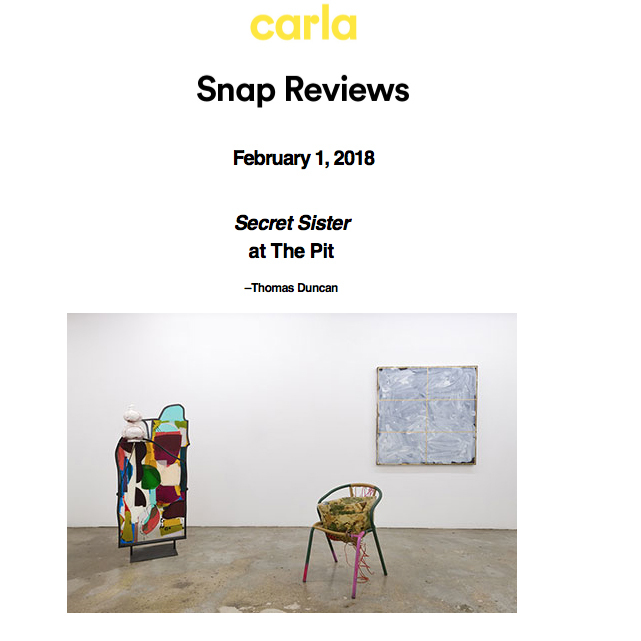 Secret Sister, The Pit’s current two-person show featuring sculptor Jessica Jackson Hutchins and painter Rebecca Morris, is reciprocal sentiment made manifest. The affinity felt by both artists when they met in 1996 at the School of the Art Institute of Chicago has, until now, never been materially explored. The exhibition often yields interplay between chosen mediums—within the proximity of Hutchins’ sculptures the golden grid in Morris’ Untitled (#10-17) (all works 2017), for example, is supremely tactile. Likewise, the glazes in Hutchins’ Drawn Onward, with their brushed, gestural application, read as paintings embedded in ceramic. Within this symbiotic backdrop, Secret Sister doles out connection and discord in a pleasingly uneven ratio. The most glaring convergences are found between Hutchins’ freestanding glasswork Writing not Writing and Morris’ Untitled (#09-17), especially in their collision of color and form. Hutchins’ fused contours of white, crimson, and cerulean glass echo the nebulous juxtapositions of the latter—pink and white protozoa shapes here, red and white morel patterning there. Upending this thread of compositional simpatico are Morris’ Untitled (#10-17) and Hutchins’ Stranger’s House. The former, a watery abstraction of white turpentine-thinned oil paint sandwiched between a black background and its textured grid is countered by the latter, a wall-mounted, blue ceramic sculpture crowned with white and sienna cylindrical forms. Just as veritable siblings often bear superficial similarities that belie internal differences, Secret Sister is a story of overlaps and divergences that resists simple encapsulation. Importantly, the artists themselves selected the exhibited works, and are hence authors of the weaving of their physical and compositional registers. At times, the narrative that fuels Secret Sister is almost as engaging as the work itself, but is ultimately a patina on the material prowess these artists possess, regardless of any affiliation.